opening at the Smithsonian’s Freer and Sackler Galleries this fall, Debra Diamond links the DIA’s tenth-century sculpture of a yogini, Thomas Edison’s film “Hindoo Fakir,” and Swami Vivekananda’s visits to Detroit and Charles Freer’s home in 1894. WISDOM is a sponsor of this event! Call the DIA for more information at 313-833-7900! See the flyer below! Join MCWS in our first annual Family Day – organized to foster dialogue within our increasingly diverse communities. Families, adults, youth, and children will be able to engage in team-building activities, join conversations, while enjoying great food, art displays and the company of beautiful people around Canton. Food is a great way to break down barriers. Gathering at meals can solidify family ties and foster friendship. Women, especially, seem to enjoy talking about food, sharing recipes and swapping food stories. Drawing on this, Bobbie Lewis, a veteran writer and new member of the WISDOM board, has started a new food blog as part of the Read the Spirit community (www.readthespirit.com). Read the Spirit is a website, publisher and e-newsletter dealing with all things spiritual in a completely non-sectarian way. Bobbie’s new blog, Feed the Spirit, will feature stories and recipes that have a spiritual component, very loosely defined. She’s looking for food stories with some connection to faith, family, friendship or ethnic culture. So if you have a recipe for your great-aunt Hattie’s apple pie and you think about your great-aunt Hattie whenever you eat apple pie – tell Bobbie about it! If every time you eat chicken soup you remember how this was the only thing you could eat when you were sick in bed and your mother would bring it to you on a tray – share your story! If you make a certain dish to celebrate a religious holiday, or if a dish represents something unique in your ethnic culture, let Bobbie know! Recipes would be great too, but they’re not essential. Comments are welcome on the blog too, so check it out at www.feedthespirit.info – or get to the blog through the Read the Spirit home page (www.readthespirit.com). It is a delight and an honor to be here. It’s particularly an honor as a man to be invited to address such a great gathering of women. I don’t take that privilege lightly-thank you. As I discussed what I should speak on with the folks who made the invitation, I was asked to speak out of my global perspective as a religious peacemaker who is at times involved in interfaith issues. But given who you are as WISDOM, I want to speak particularly aboutwomen as peacemakers and the challenges that many of your sisters pose to you and to us all. In war as it is experienced today, women are among those who suffer the most. In almost every way soldiers and armed combatants make up a very small percentage of the casualties. The vast majority of those killed and maimed are civilians, women, children,the elderly, unarmed men.-whether thought of as “collateral damage” or intentional targets to create an atmosphere of terror toadvance some political agenda. Women are over-represented among the victims, while men are over-represented among those who make the decisions to engage in warand among those who use the weapons of war. Into this context come the peacemakers-those who refuse to be victims, and those who refuse to be by-standers, and those who refuse to let their leaders wage war in their name. Among the peacemakers we men often get the prominent positions, most attention, but in the movements for justice, freedom, human rights, and peace women have so often been the ones who lead the way. I’ve seen it again and again around the world. So often women start the ball of peacemaking rolling. Women, even traumatized women, have stood up and spoken up. Just think about the founding of WISDOM. We had an excellent interfaith group going-Interfaith Partners. Some of you were part of that group and are still active in the InterFaith Leadership Council that grew out of it. So the persistent intimate peacemaking of the women of WISDOM enabled us men to find the way back together in the larger interfaith journey of our community. Truth be told we may not have survived that crisis if it hadn’t been for you. Such relationship-centered peacemaking by courageous women has been happening around the world, sometimes recognized, sometimes not. First let me tell you about the Liberian women. I’ve been working in Liberia since 1997 teaching nonviolence, and I played asmall, tangential role in some of these events. There was a terrible civil war in Liberia that just seemed to cycle around again and again. Around 100,000 people were killed, and a third of the population displaced in the war. A Lutheran woman named Leymah Gbowee felt called by God to pray for peace not in church but down at the Fish Market where the President’s car passed everyday as he drove to his office. She was quickly joined by Christian women. But she was delightfully surprised when Asatu Bah Kenneth, a Muslim woman wanted to organize Muslim women to join in the prayers. Both Christians and Muslims wondered if they could pray with women from the other religion, but finally they realized the bullet doesn’t discriminate, so they shouldn’t either. Together they all joined at the Fish Market in singing and praying forpeace. But the President ignored them. He was content to continue his vicious and violent ways. But the women were determined to stop the horrors around them. So they marched to the Presidential office building, demanding peace negotiations. Then they travelled to neighboring countries where the rebel leaders were staying, demanding peace negotiations. The women mobilized Christian pastors and Muslim imams to join them in their call for peace talks. And the talks were finally convened in Accra, Ghana. The talks went on and on with no progress in sight. The rebels who had been staying in the bush were enjoying the fancy hotel for the talks. Meanwhile in Liberia the war went on, with rebels coming into Monrovia and causing incredible suffering. Once again the Ms. Gbowee and the Christian and Muslim women acted in the strength and power of their faith. A few hundred women surrounded the conference room where the peace talks were being held and created a blockade with their bodies. They wouldn’t let anyone in or out. They demanded that the representatives of the two sides now negotiate with them as the true representatives of the suffering people of Liberia. They demanded serious peace negotiations, and they demanded to be treated with respect. Their nonviolent blockade of the peace talks conference room was the breakthrough that led to a peace agreement. It’s a long inspiring story that many of you saw in the documentary Pray the Devil Back to Hell that WISDOM showed at one of your events. But these determined women, women of different faiths standing together, praying together, crying together, putting their bodies on the linetogether, pushed through the peace agreement that ended the Liberian civil war. Then there are the Naga Mothers. The Naga people are a tribal people in northeast India. Since 1947 the Nagas have been struggling for independence from India, at times spiraling into a terrible war that has been cycling with various degrees of intensity since 1955. A failed peace process in 1975 led to splits among the Nagas so that now as many Nagas are killed by other Nagas as they are by theIndian Army. It’s a complex mess. Generations have grown up in Nagaland knowing nothing of peace. I have been working with Naga peace efforts since 1996, and in that process I quickly discovered the key roles played by the Naga Mothers. Naga Mothers Association was initially organized as a women’s social group, getting together for teas and other such events. Then they began going to the Indian army bases to collect the bodies of young Nagas slain by Indian troops. They would take the bodies and wrap them in a new woolen shawl orblanket for a traditional burial. But they had to keep going back to the army bases almost daily to get more bodies. Their grief and anger finally boiled over and the Naga Mothers became one of the leading groups working for an end to this long-standing conflict. Too many of their children were dying whether by the Indian Army or by rival Naga factions. They began traveling to jungle headquarters of Naga insurgent groups to call them to peace. They have advocated with the Indian government and connected to Indian women’s and human rights groups to call for a negotiated settlement to the conflict. In 1999 and 2000 I worked with the Naga Mothers and other community leaders to develop the “Journey of Conscience,” a nonviolent campaignof Nagas, including these bold mothers, calling for a negotiated settlement to the war. These Naga Mothers are proud and determined and vocal. I’ve also seen these Naga women join with Hindu women human rights activists in the state of Manipur, just south of Nagaland, to seek an endto martial law as well as an end to the destabilizing violence betweenthe various ethnic groups and political factions. The Peoples Dialog Initiative in is an interfaith and interethnic network with women playing some key leadership roles. The leading inspirational figure is a Hindu woman named Irom Sharmila who has been on a hunger strike for over 12 years, under arrest and being force fed through a tube. Her cause is to end martial law in Manipur and the violence against womenand civilians in which the army has engaged with impunity. I haven’t met Sharmila, but everyone I’ve worked with and trained, Hindu,Christian, Muslim, and traditional religionist, looks up to her as the voice for them all. To root these contemporary women peacemakers in deeper religious tradition I like to call them all “daughters of Rizpah.” Who was Rizpah? She was a woman who appears briefly in a terrible story in the Hebrew Scriptures in 2 Samuel during the time of the Jewish King David. The story begins with a famine plaguing Israel, and King David prays to ask God what the problem is. God tells David there is “bloodguilt” on the land. Terrible violence, had taken place and never been addressed. King Saul, David’s predecessor from another tribe, had massacred Gibeonites, engaged in what we would call today acts of genocide. The Gibeonites were an ethnic minority who had made a covenant of peace with Israel during the invasion of the Promised Land under Joshua. But Saul violated that covenant in an old-fashioned expression of ethnic cleansing. Gibeonites were massacred, and God became the only advocate for theseforgotten victims. God cursed the land which had committed this brutality, even though it was God’s special covenant people, a warning to all of us who presume upon the divine! So once David heard from God that this was a problem, he got together with the surviving Gibeonites to see what they could do to set things right. And David and the Gibeonites decided to deal with the old violence of thepast by committing new violence in the present. The Gibeonites wanted revenge: So David handed over to them seven of Saul’s sons and grandsons. These boys or young men were butchered in public, run through with huge stakes, impaled, and left out in public display. The Bible says they did this “before the Lord,” as a religious act. Violence in the name of God, in the name of religion. I’ve seen such violence practiced in every major faith that has established social or political dominance somewhere. But an amazing twist then develops to this story: God is silent. God does not lift the curse upon the land. Evidently what David and the Gibeonites did in murdering these children was not the way God saw bloodguilt being lifted/ You know, my Mother taught me two wrongs don’t make a right. Did your mother say that? Maybe David wasn’t listening to his Mom when she said that. How many innocent victims do we create in our efforts to balance the booksof terror? But in this story God is not pleased. The violence is not acceptable. And so now a woman acts. One woman, Merab, who lost 5 sons that day, simply disappears from the story. Merab becomes that eternal grieving, silent mother who fades away in the overwhelming sorrow of her loss. There are so many mothers, and fathers, and sisters and brothers and daughters and sons like Merab-victims who are frozenforever in their grief and anguish. They can never move beyond the terrible loss they have suffered. But the other woman, also a mother, Rizpah, transforms the entire story. Her two sons were also executed. She feels the sorrow as did Merab. Perhaps besides sorrow she felt anger at the injustice of her loss. But unlike Merab, Rizpah does not fade away. Rizpah instead comes out into the public space where the bodies of her sons are displayed. Rizpah with mother grief, with mother anger, with mother courage, begins apublic vigil over the bodies of her boys. She spreads a rough cloth on the ground and stays there, keeping the dogs away, shooing off the birds that circle round about. She keeps that vigil out in public, day after day, night after night. There is only one verse about her action. That verse says she began at the start of the barley harvest and continued till the rains fell. One commentary I read said the barley harvest began in late April/early May, and the rainy season started in late October/early November. One verse, but many months. Imagine Rizpah there by the bodies of her sons-April, May, June. What is happening to those bodies? What do the women in the town do? “Rizpah, come home. You’ve grieved enough. It’s time to get on with your life. You can’t bring your children back to life by this wasting of your self. But Rizpah continues-July, August September. The bodies have disintegrated in the open air and are nearly bones now. The town’s people all think she is crazy, she’s a madwoman. But she continues-October, November. And finally King David hears about her vigil. David hears and is moved in his heart by this mother. David comes. He comes publicly to the mother whose sons he ordered executed. He publicly gathers their bones. Then he gathers the bones of Saul and his other sons who had perished in the Battle of Gilboa, but never been properly buried. And David buries them all appropriately and with due respect in the land of their family. Then God heals the land. God did not heal the land in response to David’s violence. God healed the land when David reversed his policy of violence and camepublicly to Rizpah. David came, I believe, in repentance and humility. David came to the sorrowing mother in her vigil, and he tenderly dealt with the bones of her children. The violence was over. The cycle of revenge and retribution was broken. Grief was given an expression that could bring healing at long last. It’s a strange story, and Rizpah’s action gets just one verse. But her action transforms the whole story. David changes, and from his change, inspired by Rizpah, the land is healed. I could go on about some of the deeper social reconciliation that took place as a result of this action-healing between the houses of David and Saul, healing between the tribes of Judah and Benjamin, healing that lasted generations. But it was all because of the action of a woman, a traumatized, grieving but courageous woman, a woman who refused to be a victim but nonviolentlythrew herself into the public sphere to expose the horrible cost of violence. And she moved the heart of the King and lifted the curse on the land. There have been many daughters of Rizpah over the years, women who have turned their grief and anger into courageous public witness to end violence and healtheir lands. The Christian and Muslim women of Liberia are daughters of Rizpah. The Hindu and Christian women of northeast India are daughters of Rizpah. 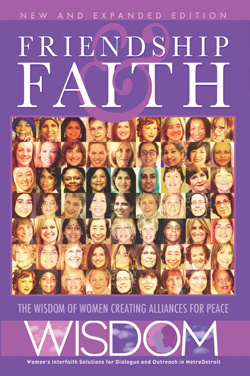 The Jewish, Muslim, Baha’i, Jain, Sikh, Hindu, and Christian women of WISDOM are daughters of Rizpah. May God bless you all, and through you bless our city, our nation and our world. Please take the time to hear Rabbi David Rosen’s TED talk below. Truly inspirational!!! Jews and Chaldean came together at the Eastern Catholic Re-Evangelization Center (ECRC) in Bloomfield Hills on May 1 to meet and greet one another, sample each other’s culinary delights, and bring much-needed items for the needy in both the Jewish and Chaldean communities. The evening began with a welcome from Gail Katz, co-chair of the Jewish and Chaldean Social Action workgroup of the Building Community Initiative started a few years ago by the Jewish News and the Chaldean News as a way to bring together two communities that have so much in common. Her co- chair is Jumhoria Kaskorkis of the Chaldean Community Foundation. Katz emphasized that the goal of this potluck event was to work together on a joint social action project to benefit both communi- ties. She hoped that bringing the communities together would be a major step in bonding with each other as human beings with similar needs, wants and emotions. About 65 people attended. Neran Karmo, coordinator of the ECRC, welcomed everyone and outlined how the ECRC takes care of the Chaldean community. Arthur Horwitz, JN publisher, and Martin Manna, Chaldean News co-publisher, spoke about the Building Community Initiative, which is continuing with some exciting plans. For example, a net- working event for the Chaldean/ Jewish Business Committee in Detroit is being organized, and an annual “Newsmaker of the Year” award luncheon, sponsored by both publications, is in the works. The entire group then proceeded to the social hall to indulge in homemade Jewish and Chaldean delicacies. At the end of the dinner, the group heard from Ellen Yashinsky Chute, chief community outreach officer at Jewish Family Service in West Bloomfield, and Sharon Hannawa, program manager of the Chaldean Community Foundation in Sterling Heights, about the critical needs in the Jewish community and of new Chaldean immigrants from Iraq. The collected items – medical equipment, toiletries and bedding – were divided between the two agencies to be distributed to needy families. State Rep. Klint Kesto, R-Commerce Township, shared a few words about his goals in Michigan state government. The Saturday main event, attended by about fifty people, included over a dozen presentations by business, medical, education, and communications professionals, as well as by faith leaders and lay-persons of various religious traditions, discussing the role of hospitality in their spiritual communities, in business, in education, and in society in general. Presenters included several names familiar to WISDOM and the southeastern Michigan interfaith community, including WISDOM co-founder and past-president Gail Katz, Rabbi Dorit Edut, public relations professional and author Lynne Golodner, writer and business professional Padma Kuppa, and Bup Mee Sunim of Muddy Water Zen in Royal Oak. Hospitality Initiative co-founders Olaf Lidums, Charles Mabee, and John Suggs gave remarks, as did representatives from Oakland University, including Dr. Richard Pipan of the School of Education, Dean Mohan Tanniru of the School of Business, and a group of OU students. Sergio Mazza, who has represented various business and educational institutions, discussed “Hospitality: The Promise for Business in a Multi-Faith World;” Dr. Sandor Goodhart, professor of English and Jewish Studies at Purdue University, talked about “G/hosts, Strangers, and Enemies in a Multi-Faith World;” and Abbot Andrew Marr discussed “Mimetic Hospitality” (multiple ways in which hospitality has been defined and expressed). Introductions to the role of hospitality in different faith traditions included Judaism (Gail Katz and Rabbi Dorit Edut), the Bahá’í Faith (John Suggs), different faith traditions in India (Padma Kuppa), American Hinduism (Vineet Chander), Christian (Dr. George Alcser), Unitarianism (Rev. Dr. Kathy Hurt), Islam (Imam Achmat Salie), Buddhism (Bup Mee Sunim), and Mormonism (Karin Dains). The day-long seminar was followed by a reception at First Congregational Church, including a delicious dinner provided by Rx Catering and a lively musical performance by Maggid Steve Klaper and Brother Al Mascia, OFM, of the Song and Spirit Institute for Peace in Berkley, Michigan. This summit was intended not as a culmination of the Hospitality Initiative’s efforts to date, but as a kick-off for the initiative’s future of hospitality education and outreach focused on helping people adapt and flourish in an increasingly more diverse multi-faith world, in which it is becoming less and less likely that the average person will live his or her life without having any significant encounters-from social to business to education to the giving and receiving of services-with people of faith and cultural traditions they are unfamiliar with. Hospitality aims to eliminate the fear of people unlike ourselves, and to emphasize the importance of extending hospitality and friendship first rather than feel suspicious until you know more. Sponsors of the Hospitality Initiative Summit 2013 included First Congregational Church of Rochester, Michigan, St. Luke’s United Methodist Church, The Bharatiya Temple of Troy, the Bahá’í Faith, Saint John Fisher Chapel, Agape Community, the Interfaith Leadership Council, Meemic, WISDOM, Oakland University, First Presbyterian Church of Birmingham, and Gail and Bob Katz. You can learn more about the Hospitality Initiative and its upcoming events at http://essentialcore.org. To inquire about a Five Women Five Journeys Program for your organization, contact Paula Drewek at Drewekpau@aol.com .